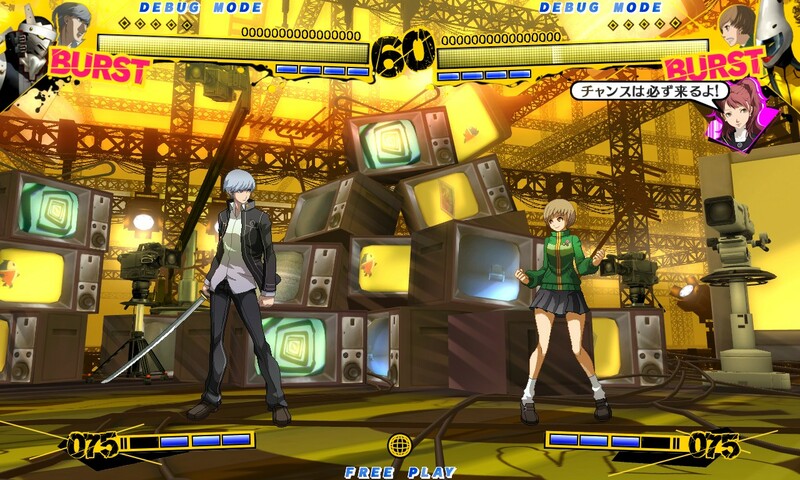 And just when I thought Atlus and Arc System Works would remain hush for a while after revealing Persona 4: The Ultimate in Mayonaka Arena, here they come with more screens. From the looks of it, this game is going have more flash than MvC3 on acid. One thing I never noticed was Rise next to the portraits of the fighters cheering you on. Though, given the context that she’s friends with everyone revealed so far (except for Aigis), she might serve more of a purpose than being a cheerleader. Also, the debate over the P4 antagonist’s name has been settled, as he’ll go by his anime name, Yu Narukami (as o opposed to the fan favorite manga name, Souji Seta). We also see more of the characters’ Personas dishing out some attacks. My assumption is that either you have to build up that super meter at the bottom to call them out for a super, or they’ll just come out for a quick moment for special attacks. We’ll know more as time goes. In the mean time, hit the jump to see some screens [UPDATE] and the trailer! This entry was posted in Gaming News and tagged (inhale) yay!, aigis, arc system works, arcade, Atlus, Blazblue, chie satonaka, P4, Persona 4, rise, the ultimate in mayonaka arena, yosuke hanamura, yu narukami on September 8, 2011 by Steven T..